Six more weeks of winter wasn’t the only bad news that the mayor of Sun Prairie, Wisconsin received Monday morning: Jonathan Freund participated in a local Groundhog Day celebration that ended in physical pain for the local celebrity. 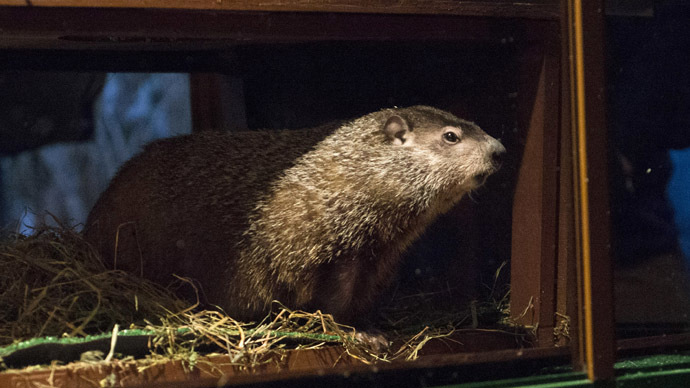 The mayor met with “Jimmy” the groundhog on early Monday, – Groundhog Day – to see if the rodent, as per annual tradition, could see its own shadow and thus determine whether or not spring would come early to the southern Wisconsin town. Not only did Jimmy predict six more weeks of winter, according to its handlers, but he also made a meal out of Mayor Freund’s ear. Local news networkers covering the Groundhog Day festivities caught Jimmy chomping on his ear live on camera, and video footage of the incident has since started circulating online. Post by WISC-TV / Channel 3000. The Associated Press reported that the mayor initially misinterpreted the groundhog’s prediction and said spring would come early this year. Jimmy’s handlers, Jerry and Maria Hahn, then corrected the mayor and said it was the opposite, but the city of Sun Prairie ultimately settled the dispute by insisting in an official statement that only the mayor can interpret the groundhog. Across the United States in Pennsylvania, America’s most famous weather-predicting groundhog, Punxsutawney Phil, similarly surmised there’d be another month and a half of winter after seeing his own shadow early Monday.